The all-star band based around Angra singer Edu Falashi has released their self titled debut album on AFM Records! Including: Emppu Vuorinen (Nightwish), Lauri Porra (Stratovarius) Casey Grillo (Kamelot) and other well known musicians, this album will be a real trip through some of the greatest musical minds known to European 'metal'. 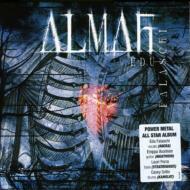 with Almah we're talking about songs with amazing choruses and exciting harmonies. No doubt the album pulls influences from Angra, Nightwish, Stratovarius along with Helloween and Edguy! the limited version comes in a Digi-pak with 2 bonus tracks.